Many gamblers are very superstitious and will resort to anything that they believe will improve their chances of winning. Examples include blowing on dice before throwing them and carrying a lucky charm. It is thought superstitions can come about as a result of winning sessions. They will look back and see what transpired during these sessions that they believed may have been responsible for their win. For example, a particular item of clothing they were wearing or certain activities they carried out, such as “squeezing” the playing cards and peaking at them during a game of 3 card poker. These are now processes that they must do every time they gamble. Likewise, if a losing session has occurred, players will look and see what they believed caused them to lose. Perhaps they had a losing blackjack session and want the dealer changed or the cards reshuffled. Maybe they were using blue chips to place bets during a game of roulette and want to change to green chips. The human brain is a complex organ and gamblers like to associate with phenomena they believe is lucky and disassociate with activities that are not. Superstitions can create the illusion of control, when in reality they control nothing in regard to gambling. At the end of the day the house always wins, otherwise casinos would not be in business. It is possible to have winning sessions in the short term, but the longer you play the odds of losing increase. 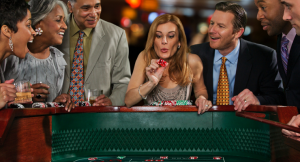 Many slot players like to press the spin button in sequences or leave a certain amount of time between each spin. However, the fact of the matter is all spins are independent of the next, so however they press the buttons, no influence can be brought over the reels. Gamblers may have a lucky shirt or underpants or may carry a lucky charm. For example some professional poker players carry unique card protectors such as Greg Raymer a former WSOP Champion, who used a fossil (hence he was also referred to as fossil man). Some blackjack players have a lucky seat as a result of winning more when sat in that particular seat. Lucky dealers are another superstition gamblers can have. It is often heard when a new dealer comes to the table “ah my favourite dealer, I always win when he/she is dealing”. A great deal of players have lucky numbers and will only play those numbers. For example birthdays or numbers that are important to them. Many also have to bet green zero or a set pattern of numbers every spin.